The buildings in Vienna tend to be: 1) beautiful; 2) old; and 3) well-built. During my student study abroad trip, I’m staying in a neighborhood-sited youth hostel, and near this hostel are some apartment/office buildings with typical, thick walls and deep window sills. 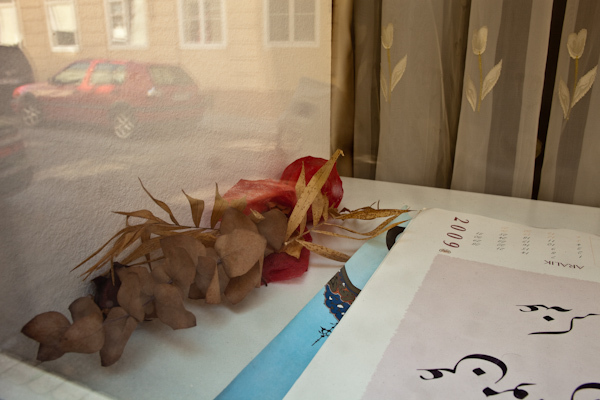 Deep window sills naturally create a place to put “stuff” and stuff is what I found while walking the neighborhood with camera in hand. From plants to blueprints to antique small appliances, lots of unique old stuff can be seen from the outside looking in while talking a stroll down the sidewalk. Of course, interesting reflections from the outside are also seen in these windows. You just have to walk slow and look carefully and interesting micro-sets of human lives can be seen. Of course, photographing into windows tends to upset folks. I was yelled out in German by several concerned Austrians who were not at all impressed or placated by my odd choice of subject matter. As far as they were concerned, I was up to no good and was invading people’s privacy (even though I wasn’t photographing any people and was on the public sidewalk and the stuff in the windows wasn’t hidden to curtains but was instead in full view of the street). Austrian’s (and perhaps most Europeans from what I’ve been told) have the general feeling that you need permission to photograph nearly everything (I just do my best to ignore them while making my image and moving on). This entry was posted in Austria, Photography, Travel.